When Amazon unveiled its new Kindle recently, I wrote about the twin paths that ebooks seemed to be taking as they gained market acceptance. On Amazon’s path, they would be tethered to the Kindle, while on the Google path, ebooks would be read on iphones and any other similar devices, whether on applications devised by Google or by independent ebook application developers. With the announcement this week, however, that Amazon has created its own Kindle application for the iPhone, the online book giant is clearly hedging its bets, while offering the free iPhone app as a taste of what Amazon can offer in the hopes that readers will graduate to a Kindle. A few months ago, I wrote about some of the oddities of Amazon’s customer review system. I suggested that certain of Amazon’s “Top Reviewers” had become semi-professionalized, and that some five-star customer reviews reach readers the same way reviews in the Times (and on blogs) do: as part of a well-organized press push. A story that appeared in Galleycat last week revealed something surprising (to me anyway): the Amazon push may work in the opposite direction, to keep an unwanted review from surfacing. Apparently, Deborah MacGillivray, a romance novelist, convinced Amazon to expunge the reviews and comments of a reviewer who had been critical of her work.Again, it appears that Amazon’s customer review system is evolving beyond “helpful, tell-it-like-it-is product information” into an extension of the publishing demimonde. This is not to say that there’s anything wrong with the American review system, in which publicists send advance copies of books to influential readers in an attempt to get press; it is, rather, to argue that Amazon should take a good hard look at its system. On one hand, it could work harder to protect the disinterestedness of customer reviews (by not kowtowing to authors, for example, or by getting rid of the reviewer rankings). On the other, it might recast the review system as less of an aw-shucks, communitarian forum. Various book blogs have been pointing to the vnunet.com story, which says that Google Book Search is causing people to buy books. The story points to data from Hitwise, a research firm, which shows that 15.93% of Google Book Search UK users click through to book store sites from Google’s site, with Amazon UK being the most popular destination. The article, and a Hitwise blog post, imply that this data means that Google Books is, despite the fears of publishers to the contrary, helping to sell books. Of course we can’t really know if that’s true. What seems more likely is that people researching particular books will do so at Google Books and they will click through to the book store sites as they try to seek out more information – user reviews, for example – on the books that interest them. Occasionally, of course they may buy some books this way.But the point, as I see it, isn’t that people are using Google Book Search to buy books, it’s that they’re using it like a library – after all, only 15.93% of users click through to book stores, and some small fraction of those go on to buy books. The additional data collected by Hitwise for the study seems to bear this out. Hitwise is capable of dividing users into dozens of thinly sliced demographic groups. Of all those groups, here are the three biggest users of Google Books UK, according to Hitwise:Low Income Elderly: Elderly people living in low rise council housing, often on low incomes.University Challenge: Undergraduate students living in halls of residence or close to universities.Sepia Memories. Very elderly people of independent means who have moved to modest apartments suitable for their needs.Bearing in mind that the Hitwise data should be taken with a grain of salt, these groups are probably among the most heavy users of brick and mortar libraries. And while college students certainly fit the profile of pirated media swappers, the other two demographic groups do not. To me, this data confirms that in the minds of the casual user, Google Book Search is a research tool, an online variety of the library – not meant to replace libraries, mind you, but meant to fill in the gaps libraries’ current online offering, namely full text search – a fact that explains Google’s cozy relationship with a number of library systems, as opposed to its acrimonious relationship with a number of publishers. *shudder* eBooks give me the willies. Not because I'm technologically slow or anything, but because I really, really love BOOKS. Paper books, bound books that I can touch, smell feel. Ok, sounding crazy now, but it's true. I'm just so afraid that things like Kindle are going to slowly make books obsolete. I've tried reading ebooks on my computer before, and even downloaded one on my iPod, but it hurt my eyes. I'm thinking now of even joining a rental service like BookSwim (a Netflix-type book service) that will just send me my books via mail that I can choose online. I've joined book groups that also share, trade, or sell at realllly low prices. I think if we share more services like these (swapping and rental, etc.) for economical and environmental purposes, we can achieve the same goal as we were trying to with these other devices. Just my two cents. I think books as objects will never die, much as records won't, though they may become luxury items. I love books, too, the smell of them especially, and the way stacks of them form a wonderful, relaxing atmosphere. But my shoulders can't take the weight of them, and my apartment doesn't have space for them, and the public library can't stock all the ones I want. I have been dreaming since CHILDHOOD of a lightweight, portable, electronic book (though back then, I just thought of it as "magic" rather than electronic). As soon as "they" form a big enough catalogue of books to go on these devices, I will run out as fast as I can and buy one (if I can afford it). To the comments that "reading e-books on computers hurts my eyes", I'd be curious to know what such people's responses to actually USING Kindle are like, given that Kindle is explicitly NOT supposed to be like reading on a computer screen (in terms of eye strain). The whole point of the Kindle is that it does not hurt your eyes. There is no backlighting, and just like the paper version, books can be read outside in full sunlight. It does require a lamp to read a Kindle in the dark, just like the paper version. Change the font size for your own comfort level. Keyword search for passages in one book, or your entire library. Bookmark pages and passages of interest. Highlight and save passages into files transferable to your PC. An entire library at your fingertips, anywhere you go. Preview any book you're interested before buying by downloading the first chapter. The list is pretty endless. When I opened up my new Kindle, there was a piece of plastic covering the screen with instructions for "getting started." I removed the plastic and realized that these instructions were actually displayed on the screen. It isn't backlit, so it feels exactly like reading a book. And you can increase the font size as you see fit. I was loathe to get rid of vinyl and cds, as I had nostalgic feelings for them. But I eventually made the switch to mp3. This is easier for me. I downloaded Proust and read from it one-handed on the subway. That is a revelation. E-books just get us closer to having it all. I still have a stack of 6 esoteric books next to my kindle. The kindle is perfect for downloading history and non-fiction texts, right as I need them, and for new fiction fixes, too. It's as comfortable to read as a book, and I can store my notes just with a few clicks, rather than using a post-it flag and typing up things later. I've already (in a day and a half) used the iphone app to literally read 100 pages while working out and waiting for my wife. And I'm not even what I'd consider to be a serious reader. The only downside is that my "reading deficit" is reduced and I can't use that joke as much anymore. I love books, and have spent a good deal of time over the years at great libraries in the United States and Europe doing research that has always required using original volumes, some published in very limited numbers centuries ago. Handling beautiful rare books is a wonderful experience, and cannot be replicated by the Kindle or any other machine. But I still applaud the new technology. The digital revolution is bringing an almost infinite amount of printed matter within the reach of millions who lacked the time, resources, or academic connections to gain access to specialized collections. It is keeping a vast amount of literature available that cash-strapped libraries can't buy or afford to keep. I love books (physical) and can't see them disappearing any time soon. But, I have to say, I just got a new kindle recently and love it. It's not like reading a computer screen AT ALL. The epaper feels so much like reading an actual paper page I find myself trying to physically turn the page sometimes (instead of pushing the button). There are some changes I'd love to see (bigger screen.. I want to read more before I have to change the page, better navigation, more books and better translation to epaper, etc), but it's working for me. Obviously, there are a ton of advantages, one of which is getting a book delivered to your door you see within ten seconds of deciding on it. But so far, I won't be buying Kindle. First, the device is too expensive. 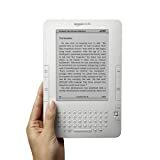 If I read twnety books on Kindle, I have to factor in the cost of the device on each book. Second, the lists I've seen of available books skew towards the mainstream, and away from the kinds of off-beat or academic things I generally want. Third, a LOT of those things they have are actually priced far above the $9.99 they mention in their public relations. Since the number of books printed has no relation to the marginal cost of the book, these prices would have to come down before I decide to retire my beautiful book shelves. Note that he loves regular books: "Listen, I'm a guy with a storage unit full of books. Let me re-iterate that — a STORAGE UNIT FULL OF BOOKS. I love reading. I devour fiction and non-fiction…." I love collecting old first edition books. That said, Kindle is a godsend if your travel a lot. The screen is very easy on the eyes, the built-in dictionary is incredibly convenient, and you can read with one had. I've owned a Kindle since the fall and I love it. And this is coming from a person who owns thousands of books. The Kindle has allowed me to continue my book habit without spending as much money and without stacks of books continuing to pile up around my house. And for everyone who think they'll miss books … they won't. It's like any other story … you get lost in the book and you don't realize you're reading it on a device. The Kindle has revolutionized reading for me. I am returning my kindle. The text, for me, is actually _harder_ to read than the text on my computer screen. The kindle screen is light gray with very, very dark gray letters. It is no where near close to black on white. Also, while you can get some newspapers and magazines on Kindle, the selection is thin – no Economist, or Harpers for example. The dictionary built into kindle is a joke. I tried to look up the word "anagogical" and it didn't have an entry. Finally, while many books are $10, I looked at one book that I wanted and it was $16.50 whereas the hard copy price (with free shipping) was $19.99. And remember, you can't sell or give away your kindle books, you only license them. So that 19.99 book would probably actually only cost me $11 or 12 if I resold it. So, I'll wait for Kindle III and give that one a try. From the moment I read about alt lit and cracked open a few PDFs, I wanted to create one. My latest article is a PDF. A congealed bit of technology, something we’re trying while we wait for literature’s savior format, not an app, not a Kindle download, but some new form yet to be discovered.